After a short break, as promised I have a few more favourite discoveries of 2012 to reveal plus the favourite Euro Crime reads of 2012 will follow soon. Today's instalment of favourite discoveries of 2012 comes from JF who blogs at Raven Crime Reads as well as reviewing for Euro Crime. My favourite discovery of 2012 is Italian crime fiction writer, Marco Vichi. 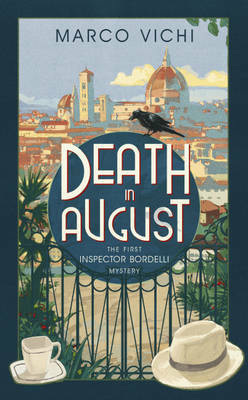 I became instantly hooked on his 'Inspector Bordelli' series this year, beginning with Death in August. Comparisons with Andrea Camilleri are unavoidable, but I actually find the more dark, sombre style of Vichi a big draw, and although not suffused by wit like the 'Montalbano' series, the deft light touches when they arrive are perfectly placed. I have now read the first three in the series and am looking forward to the fourth very much! Read JF's Euro Crime reviews here. Macho Vichi's Euro Crime bibliography (with reviews) is here. Absolutely agree. Very impressed with Marco Vichi when I read "Death in Sardinia". Hope to read more.